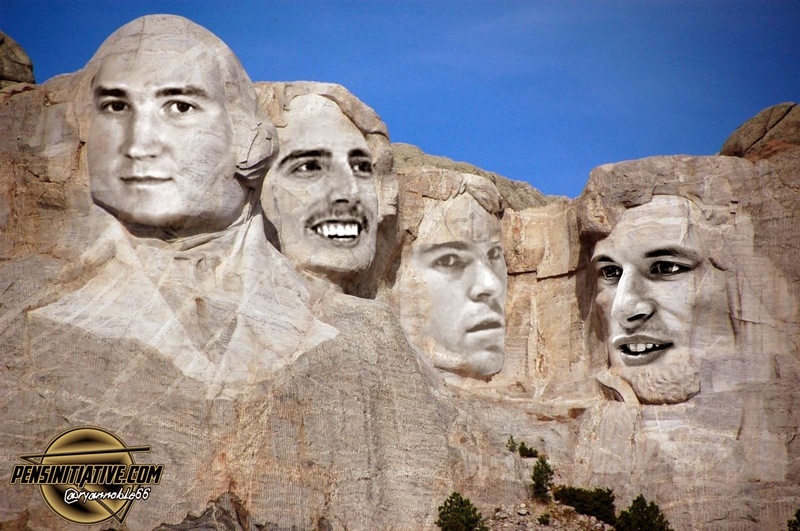 Mount Washingtonmore in Pittsburgh, Pennsylvania. Conspicuously absent in this picture: Pittsburgh, Pennsylvania. Since 1991, the faces of Mario Lemieux and Jaromir Jagr have been chiseled into the Pittsburgh Penguins' Mount Washingtonmore with good reason: they are two of the best players to ever lace up their skates in National Hockey League history. However, since Sidney Crosby has recorded his 800th point and Marc-Andre Fleury notched his 300th win, the face-filled pantheon of Penguins' historical greats may be complete. Lemieux sans mullet...that sounds like French-Canadian, eh? Lemieux's 1988-1989 campaign was chock full of highlights, including his famed "Five Goals in Five Different Ways" game against the New Jersey Devils on New Year's Eve. He finished the season with 85 goals, good enough for fourth all-time behind Wayne Gretzky's 92 in 1981-82, Gretzky's 87 in 1983-84, and Brett Hull's 86 in 1990-91. Lemieux's shooting percentage was a ridiculous 27.2% in 1988-1989. How good, exactly, is 27.2%? For starters, it's a higher shooting percentage than Gretzky ever managed, higher than Islanders great Mike Bossy's best year, but a few percentage points behind...Robbie Brown, whose two best seasons included Brown shooting at a 30% clip in 1987-88, and at 28.99% in 1988-89 (while playing alongside Lemieux). Regardless, let's translate 27.2% in a different way: if Lemieux had taken 528 shots (as Alex Ovechkin did in 2008-2009), then Lemieux would have scored a ridiculous 143 goals in 1988-89. Speaking of mullets, it's amazing that Jagr's party in the back didn't break the newspapers back in the day. Jaromir Jagr's style of play was a precursor to the games of both Sidney Crosby and Evgeni Malkin. While Jagr was a good skater, his size (notably his Kim Kardashian-esque posterior) enabled him to shield the puck away against opposing skaters. This body separation in turn afforded Jagr space to skate and stick handle along the boards. 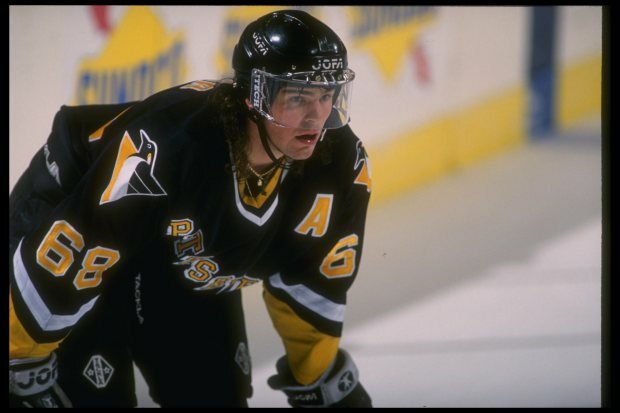 Jagr would amass 5 Art Ross Trophies for leading the NHL in scoring, including 4 in a row from 1997-98 to 2000-2001. His best season was 1995-96, when Jagr amassed an NHL record of 149 points as a right wing. This total included the Czech-born Jagr tallying 83 assists (another NHL record for a right wing). He would ultimately finish fourth in Hart Trophy voting for league MVP, far behind his teammate Mario Lemieux. 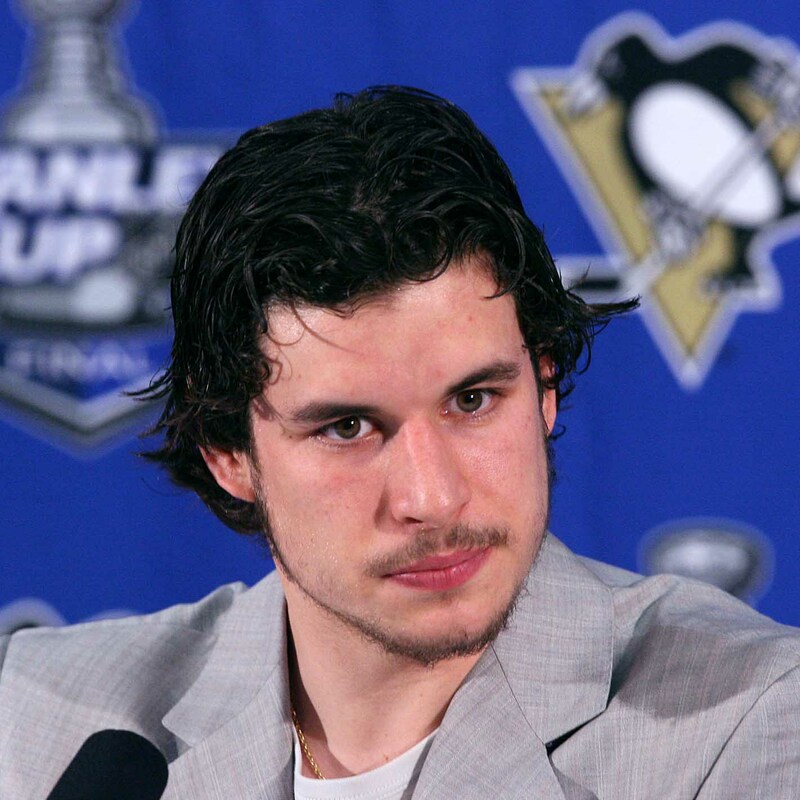 Sidney Crosby while channeling his inner "Painfully Awkward Rob Lowe"
Sidney Crosby cemented his face atop Mount Washingtonmore when he became the third player to record 800 points while donning the Penguins' crest. Crosby excels in both open ice and along the boards, where his superior lower body strength and incredible hand-eye coordination enables him to both acquire the puck and redistribute it to one of his teammates, creating an overload situation somewhere on the ice. Crosby accomplishes this despite lacking the overall size that helped both Lemieux and Jagr dwarf their competition on the ice. That said, it's difficult to not note the similarities between how both Jagr and Crosby use their own body to shield the puck away from opponents. Crosby has mastered the art of using his opponents' momentum against themselves, routinely spinning and rolling off of his opponents' attempts at reaching around his wide torso and filtering the puck to his teammates to capitalize, while Jagr excels at playing keep away. Finally, Marc-Andre Fleury. For all of the criticism levied toward Fleury, he far outpaces every other Penguin netminder in virtually every goaltending statistical category. For starters, Fleury's 301 wins as a Penguin obliterate the second-highest name on the list, Tom Barrasso (226 wins). Fleury's career goals against average of 2.62 is a full 0.26 lower than his closest competition, Johan Hedberg (2.88 GAA). Fleury also has the best save percentage in Penguins' history at .911%, a full percent better than Hedberg and Jean-Sebastian Giguere. 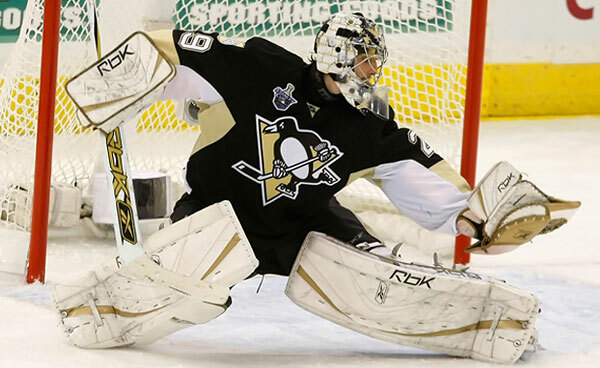 To top it off, Fleury has thus far accrued 32 shutouts, 10 higher than any former Penguin (Barrasso, 22). 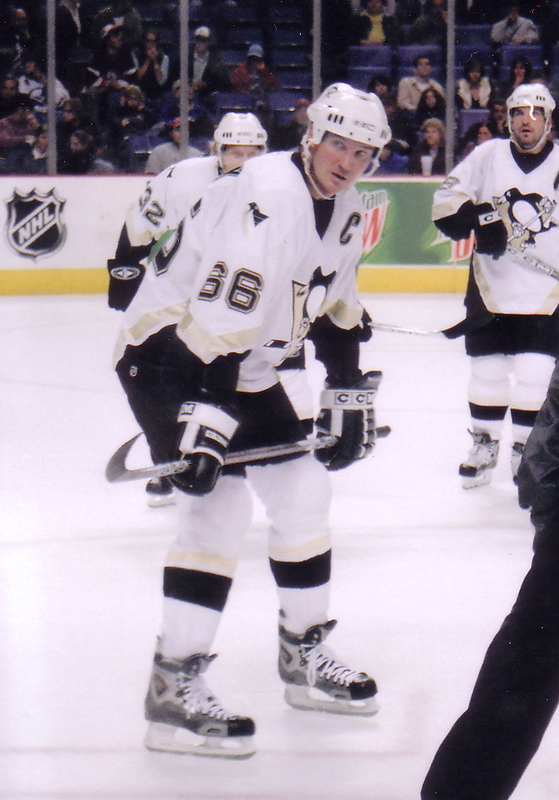 ...a score only trumped by those of Mario Lemieux (167.9), Jaromir Jagr (117.1), and of course, Sidney Crosby (94.2).